Summary. The pictogram represents the 3-D image of the information cell of civilization of fourth-individual level of consciousness. However, such heterogeneous structure will lead to destruction of humanity in global cataclysms. For continuation of our life through the Transition is required homogeneous structure of the united cell of civilization. It corresponds to the fifth level of consciousness – united consciousness. The pictogram shows the crosses, built of cubes. The top part of each cube is marked by small grids. Each cell of this grid represents a brain’ area of human being’ individual cell corresponding to the fourth level of consciousness. Similar image of civilization’ cell has already been repeatedly shown in crop circles. 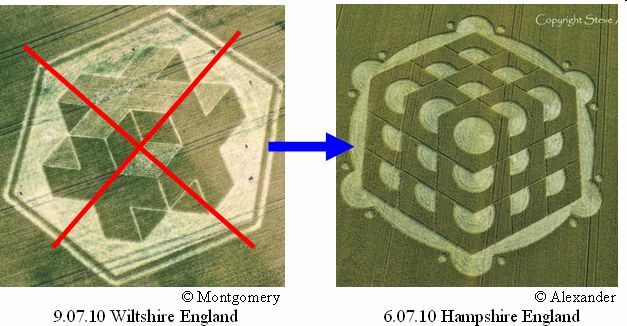 On one side of each cube are shown almost the same grid as in crop circles on 1.08 1997 Wiltshire, England; 2.07.00 Wiltshire, England, and 8.07.06 Oxfordshire, England. The cube is a superstructure over the information cell of civilizations, as the tense square tent. The cube represents the integrated enlarged area of a brain of every human being of our civilization. This image shows that each of us has individual consciousness, i.e. everyone struggles for himself, for the place under the sun. I-N-D-I-V-I-D-U-A-L!!! And even there is no hint on any elements or separate area of the united consciousness. Undoubtedly, there are churches, synagogues, mosques… There are monasteries,… pilgrims and holy people... There are philanthropists ... But ETC show that in the vast massif of civilization - 6.8 billion of people – they are not visible. The exceeding quantity of people lives by the principle – everyone for himself. In our civilization, in terms of ETC, are no compassion and mutual support. The civilization is torn apart by wars and terrorist attacks, hatred, greed for money and power. Thus, in general a brain area of each of us as the accessory of civilization’ cell, is presented by a quadrangular cube. The pictogram consists of multi repeated cubes. So, ETC inform that today consciousness of our civilization corresponds to the fourth level, i.e. individual consciousness. Information cell of Earth civilization, consisting of 6.8 billion individual cells, ETC often represent in various objects of the System of Information Transmission. Thus, it is presented in Maras, Peru by a huge salt mines massif of over five thousand squared shaped salt-pools. 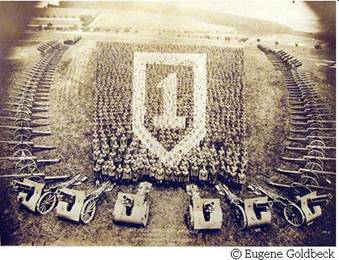 It is also presented in many crop circles. The external hexagon shows a carbon basis of our life. Here are some crop circle examples showing the carbon basis of humanity. In the previous message 6 July, 2010 Hampshire, England ETC have shown necessary structure of mankind’ cell able to make the Transition for life’ continuation. It is the cell of the united consciousness with homogeneous resonant structure. Thus, ETC showed that now on Earth is emergency situation. For prolongation of our life only high homogeneity structure is required for bio-resonant activity which will lead to repeated strengthening of the united consciousness action. In the result, a beam of bio-laser will arise at the moment of consciousness’ synchronization revealing the highest resonant quality of the united cell structure. A bio-laser beam will remove our body from the level of global cataclysms - the level of Crystal Structures. So, we will make the Transition to a safe level of the material world. This ETC pictogram warns that with individual consciousness we can not make the Transition, and our civilization will be perished in started global cataclysms of the planet’ destruction. Thus, if our civilization will not in time creates a deeply structured united consciousness then, we ourselves put a cross on our future. Numerous grave crosses, presented in the pictogram at different angles, correspond to the fourth level of individual consciousness and clearly show the future of our today’ civilization with individual consciousness. Volume 3-D figures indicate the need for the immediate formation of the united consciousness for the Transition in a new cycle of life. ETC in pictograms have already repeatedly pointed on grave crosses, corresponding to the fourth level of the individual consciousness. ETC specified the reason of presented cross – the destruction of mankind in global cataclysms in the result of critical decreasing of Earth magnetic field, which they represent by symbols of hysteresis loops. The most important, that the cause of civilization’ destruction is misunderstanding the necessity of the united consciousness formation. Many crop circles warn about necessity for the Transition to a mode of the united consciousness. Two of them are presented below. 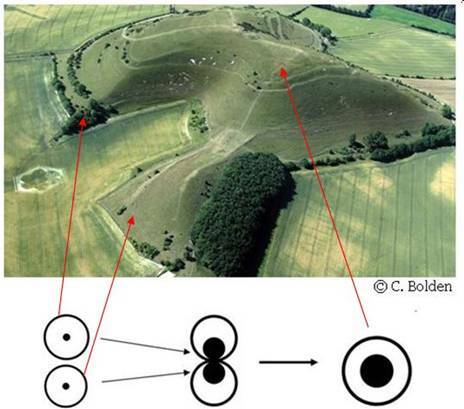 It is important to note that the decoding pictogram appeared near the Cley Hill with the shape presenting the principle of the united consciousness formation, necessary for civilization’ Transition in a new life cycle. At association of two individual cells, with small area of a brain, i.e. consciousnesses of two people, the united cell with the expanded area of a brain is formed. The pictogram represents the 3-D image of the information cell of civilization. Thus, ETC show that our individual consciousness corresponds to fourth level. However, such heterogeneous structure will lead to destruction of humanity in global cataclysms, because we will remain on the same level of the Crystal structures. For continuation of our life we have to make the Transition to the Highest level of material world. For the Transition is required homogeneous structure of civilization' united cell. It corresponds to the fifth level of consciousness – united consciousness. This required structure of our consciousness ETC demonstrated on pictogram 6 July 2010 Hampshire, England. In this pictogram ETC through external hexagon specifies on a carbon basis of our life indicating that this information is for us. ETC showed that now on Earth is emergency situation, connected with misunderstanding the necessity of the united consciousness formation. It will causes the destruction of our civilization in soon began global cataclysms. ETC insist to spread this information widely. ETC confirm that only high homogeneity structure of the united cell with resonant activity can cause the united consciousness action of huge power in the form of bio-laser beam. It will arise at the moment of civilization’ consciousness’ synchronization and will remove our body from the level of global cataclysms – the level of Crystal Structures. So, we will begin the new cycle of life at the safe Highest level of the material world. This principle of the Transition ETC constantly use for intergalaxies flights in the universe. It is known as teleportation. So, the pictogram informs: if our civilization in short time not create the united cell with deeply homogeneity structure, then, we ourselves put a cross on our future. I was intrigued to find another crop circle with great similarities to Cley Hill, however I could not identify the location and date of it. Nevertheless I added one to another and ended up with a possibility of a new formation for the future!